I’ll start at the beginning. 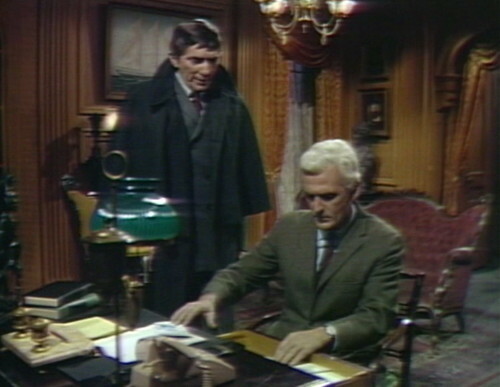 Barnabas is minding his own business, when there’s a knock at the door and in comes Dr. Lang, all perturbed and hollering as per usual. Lang: Barnabas! Are you all right? What about the accident? 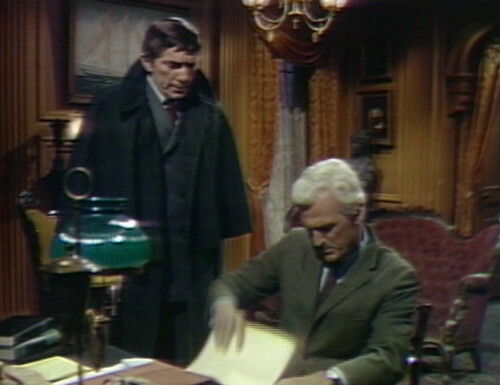 Barnabas: What are you talking about? Lang: The message that you left on my answering service. Barnabas: I left no message. Lang: The message said for me to come over here, no matter what time it was. Are you positive? Barnabas: Of course I am. So right away, we’ve got a problem. What do you mean, “are you positive”? Either you leave a message for someone’s answering service, or you don’t. It’s not that much of a gray area. 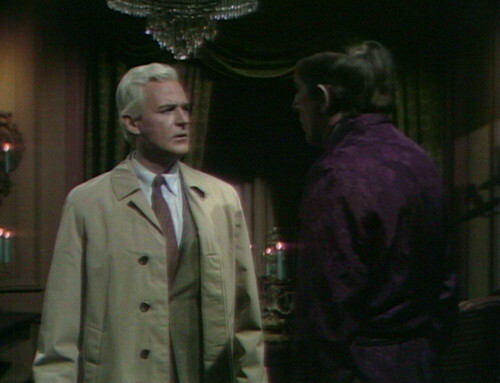 But the real problem is that Lang doesn’t even acknowledge that Barnabas is wearing a brand-new deep purple robe, and he looks stunning in it. I know things can get hectic on this show, but come on. Open your eyes. 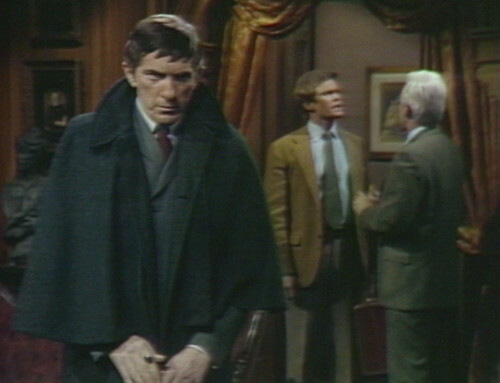 Barnabas: Are you here, listening? Are you watching us, Angelique? Lang does an exaggerated double-take, looking around the room. 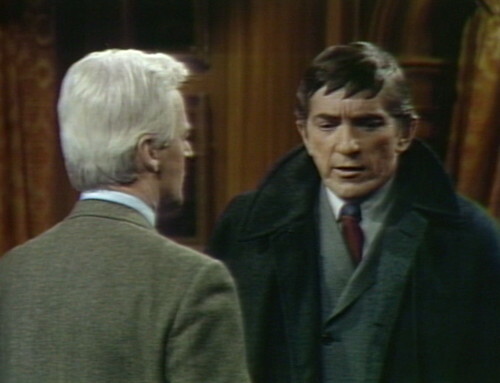 Lang: Barnabas, wouldn’t we be able to see her? Barnabas: You have no idea of her powers, none! Lang: Well, I don’t understand! Why does she want me here? Lang: It doesn’t make any sense. Barnabas: Oh, yes, it does, believe me. It makes sense to her, or you would not be here. 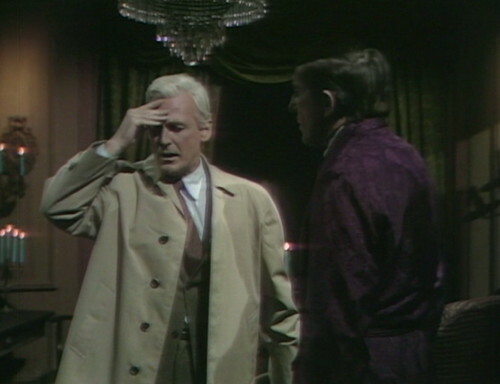 Lang: Barnabas, I really don’t understand any of this. Okay! Dude, we get it. You don’t have a lot of sorcery experience. It’s not necessary to say “I don’t understand” every time the other person in the scene takes a breath. 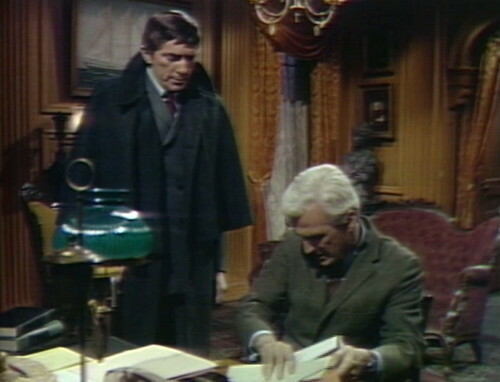 Barnabas: Do you have your talisman with you? Lang: Well, yes. I think so. Barnabas: Make sure you do. And then he does this elaborate pantomime on the theme of Guy Who Can’t Remember Where He Put His Talisman. 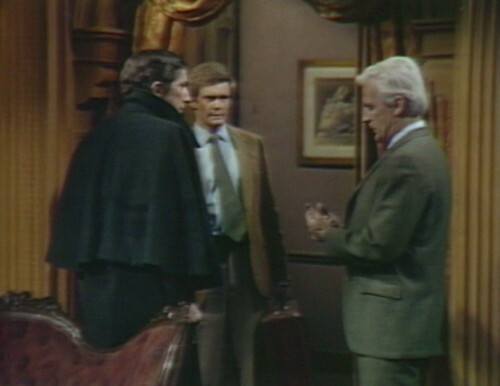 Barnabas: I told you to carry it with you at all times! Lang: No, wait, wait! Let me — let me think. And then he puts his fingers to his temple to indicate that he is taking a moment to think. I swear to God, this guy. He finally comes up with it. Lang: No, it’s in the desk. 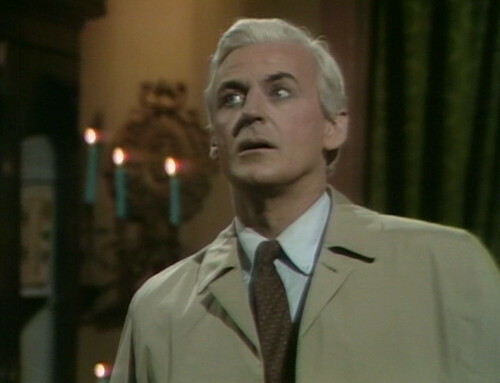 Fortunately, it’s been about 170 years since the last time Barnabas shot a guy in the face, so he’s out of practice. But, for Pete’s sake. What’s it doing in the desk? It’s the thing that’s keeping a witch from murdering you. How can you not tell the difference between your pocket and a desk? 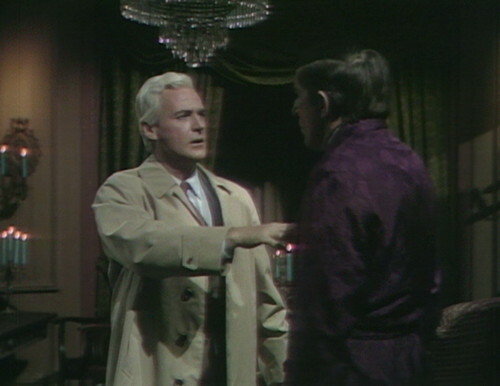 Now, really, this is just ordinary plot-mandated stupidity, and it’s not worth getting bent out of shape about it, but Addison Powell is The Worst Actor Who Ever Appeared on Dark Shadows, and at a certain point you just run out of patience. Here he is, closing out the scene by indicating: I wonder if there’s an invisible witch watching me right now. Look at this clown. So they rush back to Lang’s house, and guess what, it’s time for Addison Powell’s stirring rendition of Guy Who Can’t Find Something in His Desk. He starts rooting through the desk, pulling out files and papers. Lang: I’ve got to clean out this desk, one of these days… It must be here. And he just keeps rummaging through the drawer. 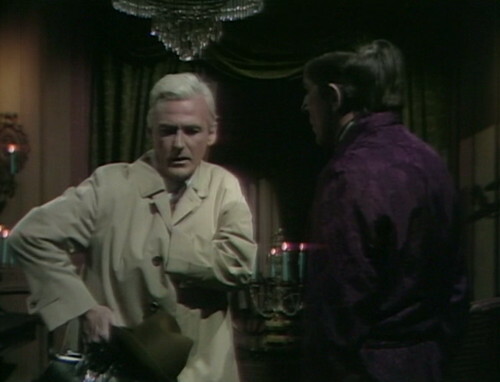 Finally, Barnabas says, “It isn’t there, is it?” And Lang takes that as a cue to start scrambling around again. This sequence goes on for approximately eight hours. 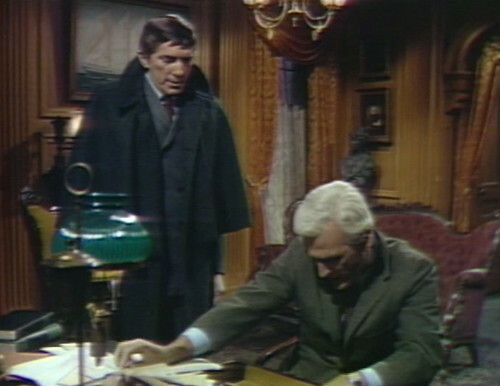 As he does in any crisis, Barnabas heads straight for Plan A.
Barnabas: I should go to Collinwood, and find her, and drag her from the house, and BURN her! 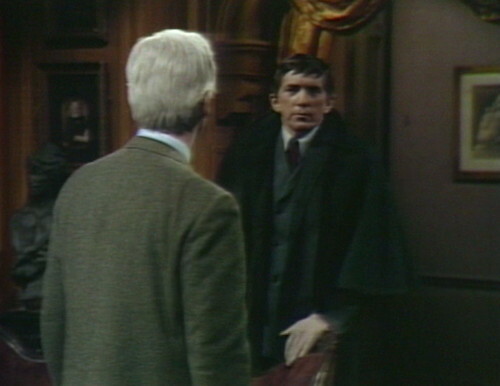 Barnabas: It’s my only way of getting free of her! 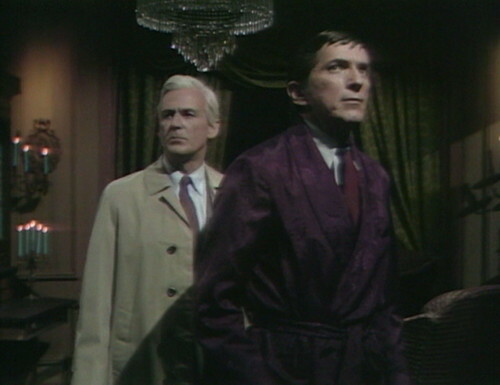 Barnabas walks to the door, and Lang calls after him. Barnabas: It could be done, and no one would know! She would simply disappear. Lang: There’d still be a lot of questions. And that’s when you realize Barnabas actually meant it. He was about to head for Collinwood. That’s how his brain works. The strategy meeting is interrupted by Jeff, who’s carrying a suitcase. Jeff: What happened to me? Lang: Well, you, uh — you fell asleep. Jeff: Fell asleep? I was supposed to be packing. So on behalf of the audience, I would like to say: wait, what? It’s still the same night that Julia hypnotized Jeff? 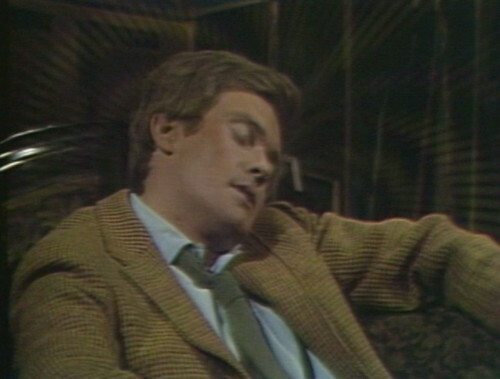 They really know how to live it up in Collinsport; the nights last forever. And the amazing thing is that everybody is still wearing a tie. Jeff says that it’s nearly dawn, and here they all are, hip-deep in neckwear. Jeff actually woke up and put on a tie, just to go downstairs and yell at Lang. 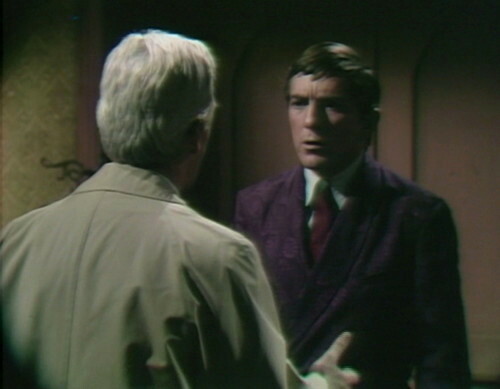 We even saw Barnabas wearing a tie while he was relaxing at home in his purple dressing gown. Was it a rule in the 1960s that everybody on television had to wear a tie? But let’s move on to the next scene, where there are even more pressing fashion concerns. Jeff was living at Lang’s house, but now that he’s quit his job, he needs a new place to stay. Vicki arranged for him to stay in the spare room at Maggie’s house. And, oh my god — she’s wearing the skirt. You remember the skirt, obviously. It’s impossible to forget this skirt. Maggie wore it in one episode six months ago, and I still haven’t recovered. I don’t usually pay this much attention to the outfits, but it’s just that kind of episode today. There’s not really that much happening, so they’re distracting us with wardrobe. It’s working pretty well. And then it’s pretty much all Dream Curse from here. This is an experimental storyline that they’re trying out, where they just do the same two scenes over and over until they run out of audience. Last week, Maggie had a dream about Jeff — he led her down a hallway to a dark room, where she opened a door and saw a glowing skull. When she sees Jeff today, she feels compelled to tell him all about the dream. The weird thing about this storyline is that telling people about your dreams is pretty universally recognized as one of the most boring things you can ever do. And yet, here we are. So it’s only a matter of time until Jeff dozes off, and guess what, he has the same dream that we’ve just been hearing about. In Jeff’s dream, it’s Dr. Lang who shows up at the door, to lead Jeff into the nightmare. So Lang takes Jeff to the mysterious room, where it’s all doors and candles and smoke. I’m kind of torn right now, because if I really want to represent what this episode is about, I should be going into way more detail on this dream stuff. Half of the episode is Maggie describing her dream to Jeff, and then Jeff having the exact same dream that Maggie described. But the problem is that I don’t have a punchline, or an insight, or anything. Usually, I can craft some kind of point out of the raw material that the episode hands me, but this Dream Curse stuff is a real challenge. The dream scenes take up a big chunk of the running time, but they don’t really connect to anything, so the episodes end up like this one, just a rambling shaggy dog story with no unifying theme. So all I can do at this point is to say: hey, look, Jeff’s asleep and he’s still wearing a tie. It’s not funny, and it doesn’t really mean anything, but there you go. And then he wakes up, and it was all a dream! But I guess we knew that already. 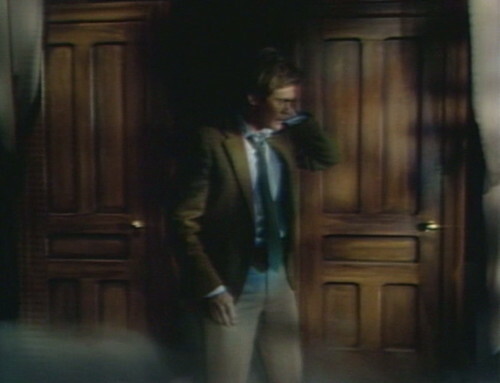 Also, the smoke from the dream set spills over into the Evans cottage, so when Jeff wakes up from the dream, he’s still surrounded by a thick carpet of fog. It’s ironic that such a well-loved show should feature some of the least-liked actors among fans. 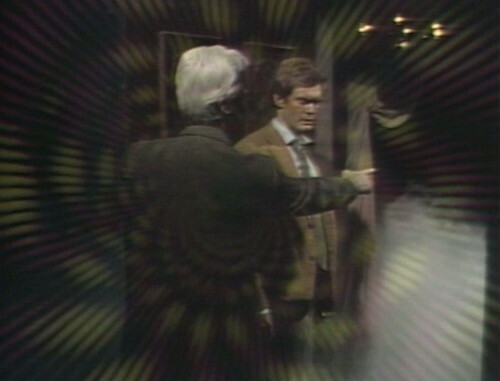 There’s a Tumblr page devoted to Dr. Eric Lang, and he’s thought of there too as the worst ever actor to have appeared on Dark Shadows. It comes down to what Dan Curtis said: “I just hired people I liked. I couldn’t tell if they could act or they couldn’t.” So, who knows, Addison Powell might have been lots of fun at parties. 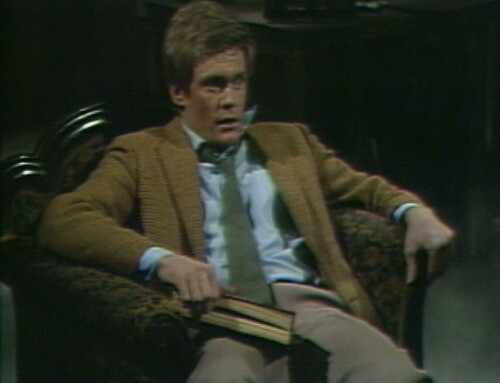 And Curtis liked Roger Davis enough to have him back to play someone else after his first character gets killed off, and he was the first one on the show they tried this repertory approach with. That furniture ornament that Maggie Evans is wearing is strikingly hilarious. It seems that there was only one such garment that was ever made, because I can’t think of any other show where you see such a homely dress, if you can call it a dress. It looks like something that should be draped over the back of the couch in your grandmother’s living room. What were the folks at Ohrbach’s thinking, to design something that would make Maggie Evans look like a piece of furniture? 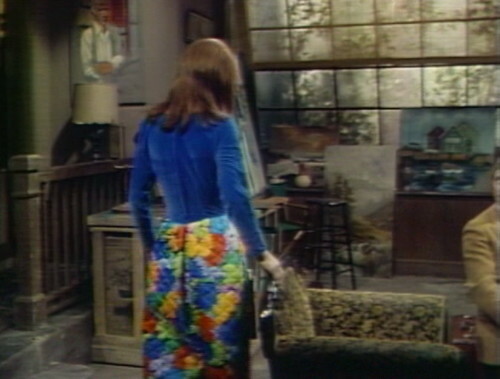 In the episodes where the walking couch wrap appears, you only see Maggie frumping around in the Evans cottage with it. You never see her sporting it for an evening out down at the Blue Whale. We still have a long way to go before we finally see Maggie properly attired in those Junior Sophisticates minis of 1969 or so. As for the Dream Curse, it does have its moments. 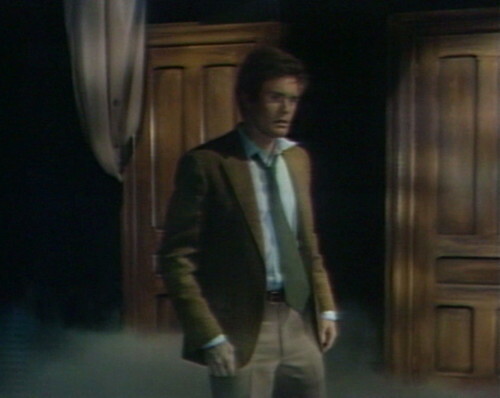 The best parts are when we see what the effects of not telling the dream has on the characters, in particular Mrs. Johnson and the way they try and fail to keep her from telling it to David, and how she hides outside the Old House waiting to relieve herself as she finally follows David back to Collinwood. That mixed look of hopefulness and pent-up anxiety as she stumbles across the front porch after David is priceless. Another memorable scene, probably the best of the lot, is when Willie climbs in through the window of Carolyn’s room in desperation. 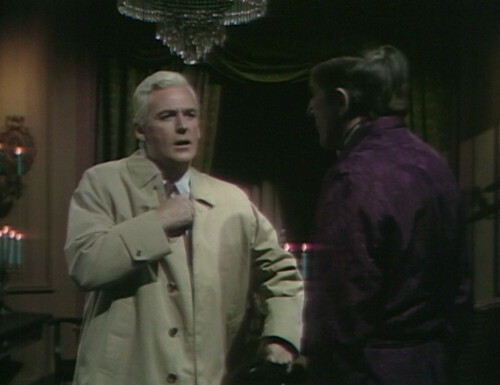 I think that scene featured one of John Karlen’s best acting moments as Willie Loomis. And yes, in the stills shown above, even when Lang is not speaking he sure does gesture loudly. Even his body language is spoken with capital letters and exclamation points. The worst thing about Maggie’s skirt is that they’re actually pants. Quilted pants of doom. Maybe they were home-sewn–here’s a pattern illustration for them: http://vintagetvfan.tumblr.com/post/47576848323/now-where-have-i-seen-those-pants-before. Typing in simply “dr eric lang tumblr” brings you to the “dr. lang you are so stupid” page, as well as several other links to Tumblr pages devoted to Addison Powell and his characterization of Dr. Lang, all done with humor and affection of course, no matter how annoyingly over-the-top he is perceived. I would argue that the first person they did the repertory company thing with would either be Kathryn Leigh Scott (Ghost of Josette/Josette) and/or Thayer David (Matthew Morgan/Ben Stokes) or really any of the 1795 characters. However, I see your take in that he was probably the first character of any of the ‘present’ day characters to get another character in the same time period. Although Thayer David got another character before him in the same time period. Matthew Morgan/ Professor Stokes. So that might throw your theory out. Addison Powell. Roger Davis. The Skirt. I had the same thought Joanne. And then I figured given the time it would probably not be “proper” for a man to stay in the same house as his girlfriend, even if said house had 40+ rooms. I know the sexual revolution was in full swing, but this is Collinwood and maybe Elizabeth wouldn’t be happy with it. Also, maybe Vicki just didn’t want to spend that much time with Jeff – can’t blame her. True – I thought that too – later in the series Carolyn does put up her boyfriends Chris Jennings and Jeb Hawkes at some of the guest cottages on the estate plus she even had ‘Adam’ holed up in the West Wing for awhile. But that’s what happens when you allow Victoria Winters into your life. You will never know a peaceful moment. Maybe she gave the same pitch to Liz, and that’s why he’s not staying at Collinwood. My mother had a dress like Maggie pant suit. It was officially called a hostess dress, for a casual party at your home. My mom s was black, and the skirt was black, gold paisley. It WAS from orbachs, and it was cute. The skirted part could stand on its own, but im pretty sure THAT wasn’t a selling point. Some weeks ago, a friend who shares an interest in 70s Euro Horror with me sent me home with a movie entitled “La Rose En Fer” (The Iron Rose), & I was very amused to see the main character, at a wedding, in a red patterned quilted skirt much like Maggie’s “groovy” getup…this is a Jean Rollins film, subtitled in French, & suitably eerie (if not a little grotesque) — made in 1972! 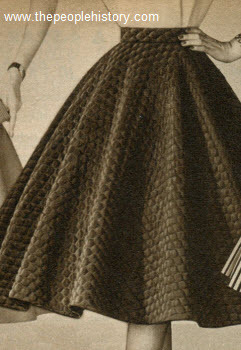 So the quilted skirt or gaucho set lived on, at least in France, into the 70s. Although perhaps this style was favored only in horror productions. I recall that a relative crocheted me a vest like Amy Jennings is soon to be seen in, & I loved that thing for years after it went out of style because Amy wore one like it on DS. Danny, your opening was such a great piece of writing. nice point. i was thinking the same thing. 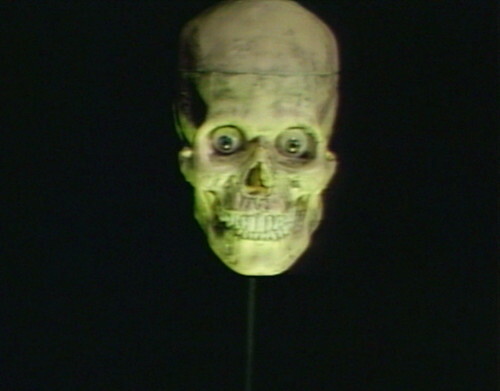 You can see the stick that holds up the skull. I was laughing. Not in a good way. My mother gave me a child’s version of that skirt, and made me wear it. I’m still traumatized. Is it just me, or does there seem to be a blooper (or awkward dialogue) when Maggie is talking to Jeff? It’s an odd question to raise at that point. Also, Jeff already told her she was on her way at the start of the scene. Or maybe she’s just so rattled by the dream. I have always wondered why these people who never go anywhere are always so formally attired. Liz’s hair alone would take hours. Lame episode, but the Hilarious blog entry and comments made it all worth it!